Hi!!! The last few days many learners have asked us about Greeklish. I would like to clarify some things about it. In some courses, such as the Russian or the Ukrainian, Duolingo has activated the transliteration mode feature, therefore users can learn these languages using either Cyrillic or Latin letters. In Greek and Hebrew Duolingo hasn't activated this feature (at least yet). We asked the staff some days before Beta release and this was the answer: We haven't scheduled work yet. It will take time as our engineers have their plates full, but we will put it on our list. We will go ahead and release into beta even without the latin characters for now. Many learners can't use the Greek keyboard! We have added some links with instructions below. For online Greek keyboards click here and look at the 'Greek Keyboard' section. As the transliteration mode feature is not activated yet, we have started to transliterate sentences in Greeklish manually. We will transliterate ONLY the best Greek translations in each sentence, but this will last some months if it is to transliterate all Greek sentences. We are planning to implement language rules automatically. We are discussing this with the Duolingo staff and this is the reason why there is no progress on manual transliteration the last days. The best way to learn a language is by using the alphabet of that language. However, to make your experience on the Greek course easier and more enjoyable we are providing two methods to choose from to write your answers. Here are some links to easily convert your keyboard to enable you to use both Latin and Greek characters as you need. We have found these easy to install and simple to use. If you have any other links please share them with the community. These are the sentences that will be considered correct. As you can see the transliteration to luludi ke to pop [korn/corn] will be considered correct, but the transliteration to anthos ke to pop corn will be considered wrong. Greeklish has two main subversions. The Phonetic Greeklish (the Greeklish letters are very close to the sound of the equivalent Greek letters e.g η is i, θ is th, ει is i, ω is o) and the Symbol Greeklish (the Greeklish letters in this version are similar with the equivalent Greek symbols e.g. η is h, θ is 8, ει is ei, ω is w). We have adopted Phonetic Greeklish, because it is preferable for teaching purposes, although Greek speakers use mainly Symbol Greeklish. αυ ---> av OR af depending on the letter that follows. ευ ---> ev OR ef depending on the letter that follows. Only the above transliterations will be accepted. We are still working on Greeklish and it will last few months. This post will be updated every time we add Greeklish in more skills. ONLY the best translations of each sentence will be transliterated into Greeklish, therefore it is better to type in Greek. We are planning to implement language rules automatically. We are discussing this with the Duolingo staff and this is the reason why there is no progress on manual transliteration the last days. I find it weird too, but people do it all the time, even with languages whose alphabets are nigh on perfectly phonetic! It seems to me that an essential part of learning a language is to learn its alphabet and how to read and write it. There might be some rationale for skipping this if you were learning conversational Greek but for a course which is largely based on reading and writing it seems to me to be indispensable. After all, if you visit Greece there will be no handily transliterated signs, they will of course all be in Greek. Furthermore, if you are struggling with using a language in real life, it can be useful to have a notepad to write things down, such as names of hotels, addresses or prices, it goes without saying that in Greece, they will be written in Greek. Because of this I have written a step by step guide to installing an on-screen Greek keyboard on an Android device, which will hopefully be helpful to at least some of my fellow learners. For anyone using an Android tablet it is possible to convert the native keyboard to Greek very simply by downloading the Greek language package and then toggling on the world icon. In addition, there are any number of Greek keyboards available in Google Play Store some free and some paid. My preferred keyboard is the Google keyboard app, which has a huge choice of languages available including Greek. As with the native keyboard the on-screen keyboard shows the Greek letters and is easy to use. This will change the keyboard layout from English to Greek. To revert to English repeat the process. You can now toggle easily between the two layouts and scripts. Note, if you have more than one additional language installed you will initially need to go through all of them to locate Greek, however, once you have begun the keyboard will just toggle between the two languages you are using. I have found that the Google keyboard is the most user friendly but there is an element of personal choice involved. Edit. Note that I am not referring to using the app which does not yet offer Greek but using Duolingo in the browser of your tablet. I find Chrome works well but Duolingo will work on any Android browser. I have also posted this guide as a reply to Jaye16's list of resources. Thank you so much! I have been struggling with accessing an online language tool which took a lot of the fun out of my Duolingo sessions. This is brilliant and I am sure will reinforce my learning. The thing is, it's simply MUCH easier to learn the Greek alphabet than to learn the Modern Greek system of romanization. And if you know any Ancient Greek (as several of the learners here seem to), trying to do "Greeklish" will simply be unnecessarily confusing -- for example, και as ke and η as i rather than e. This of course makes sense as reflecting the modern pronunciation, but will just be confusing if you already know or plan to learn Ancient Greek. Anyone who's studied math and science has learned most of the Greek alphabet already! These are a few we find easy to install and to use. If you have others please share them with the community. If you encounter problems let us know so we can inform others. Check out the other comments on this page. Edit. I have posted this separately on this page as well. @annwitbrock I use Duolingo on the browser of my tablet, not the app I very rarely use the app for anything. I use Chrome myself but Duo will run in any Android browser. I already have too many keyboards on the tablet. It only takes 4 or 5. I didn't think of using the browser (and it has been very unstable recently). The app is pretty good on the tablet, but I miss being able to refer to the grammar sections and browsing the vocab lists. Browser is a good call. Will remember I still have that option. @annwitbrock I am glad you have been successful in adding the keyboards and had a good play with the various options. I find that resisting the temptation to add Azerbaijani or Thai just because I can is almost overwhelming but you're right, it is so much better to have all the languages easily accessible and it gets easier to use with practice of course. As for browsers as far as I know Duo will run on any Android browser not just Chrome, so if you are running out of space you could almost certainly use the native browser, or whatever browser you are currently using. The reply button always disappears after a certain number of replies but as you have seen, using the last reply button in that conversation works just as well. @annwitbrock I use Chrome and it is generally very stable. I think all browsers have their "funny five minutes" but overall, I've found it to be the most stable of the lot. If you don't mind me asking, why do you have so many keyboards? I only have 3 ... the native keyboard, Google keyboard and a bluetooth physical keyboard. I currently have 15 languages enabled on both the Google keyboard and the blutooth one. The native one, like yours has a much more limited number of language options. Just as a matter of interest, I am currently writing this on my Android tablet, using the Chrome browser. Reply button is missing on your comment for some reason. I admire the discipline of your very long streak! I am using the Duolingo app on my Android smartphone and managed to enrol in the Greek course using a different login from my other courses. I would counsel against installing Greek as the input language as your phone/tablet will adopt Greek as your input language for the GUI and you will have to keep switching back and forth and you will also need to be able to read the Settings menu in Greek to get back your native language! The solution is to leave the Language and Input setting alone and simply install a Greek keyboard from the Play Store. In lessons you can switch keyboards by clicking the keyboard icon on the task bar. Hi Andonelli, if you have another look at the guide I posted you will see that I am not suggesting for one minute that anybody should change the input language, merely to add another language to their existing keyboard. Whilst you can find many different keyboards on Google Play and I have indeed suggested people should look there also, the majority of native android keyboards offer Greek as an additional language. I would never advise anyone to change their input language unless they were reasonably fluent in the other language. After creating a new user account using a different email address. The ui is a bit buggy - audio is not always available - but nothing major. Further to my post on using a Greek keyboard app in Android. I recommend the Greek keyboard by sql which is available free in the Play Store.
. On the Greek keyboard there is a κey with the label SMS. Clicking on that key will change the Greek keyboard letters to upper case and the SMS key's label will change to EN. Clicking EN will bring up the English character set within the Greek keyboard, and the EN label will change to ! @# giving you a symbols character set. The ! @# label will change to GR so clicking the key again will bring you back to the Greek alphabet character set. These shortcuts will save you switching in and out of the Greek keyboard app to the English system keyboard within lessons. Hi and welcome to the Greek for English course. You say you "did all this" which I'm assuming means you now have the Greek keyboard. You should also know that words are not rejected because they do not have accents. If you write: μαμα instead of μαμά Duo will accept it but tell you "Almost correct". Hope this help and best wishes. We are here for any other questions you have. AghaZC **"On windows 8 I use the touch keyboard even though my computer does not have a touch screen You can get it by right clicking on the task bar - choose toolbars - touch keyboard You can then add the greek language from language settings. Edit I knew this recently Write ; (semicolon) before the letter you won't notice any changes, but as soon as you write the letter you will find it accented ; + α = ά ; + ι = ί**"
It gives you the full ability to type in Greek, Chrome users can install it as a browser extension, you can see a visual representation of the Greek keyboard layout on your screen if you feel that you need it, and it is very easy to turn it on and off as needed. Yes, that's the one I have heard about with the Greek keyboard on your screen. Many thanks. I suggest everyone at least try to learn the Greek alphabet. I started learning Greek nearly a year ago and I can definitely say learning the alphabet is one of the easiest things about learning Greek. And once you know it, you can read and pronounce almost every word, unlike English. It takes 1-2 weeks to learn the alphabet depending on how much time you spend. What I did was write down and sound out each letter over and over again, filling up many pages. Learn maybe 3 or 4 letters at a time. And it worked really well. If you're concerned about your keyboard not having Greek letters on it, don't threat too much. The sounds of the letters ερτιοπασδφγκλζνμ match roughly the same letter sounds as on the English keyboard. That just leaves learning where the ςυθηξχψωβ keys are. And it shouldn't take too long for your fingers to learn where they are with a good amount of practice. I totally agree. While living in Greece, I learned to read the Greek alphabet. I'm learning Greek now, but I can sound out almost every word easily now, even if I don't know what it means! I find Greek one of the easier languages for learning the sounds, after just a bit of practicing the alphabet. It looks hard, but it's really not that bad. I think you meant "fret", not "threat" here ;-) Very different words in English. I can type Greek (windows 10 makes it possible) but I am having troubles switching constantly from Greek to Latin letters. My proposal is that DUOLINGO adds a constant virtual keyboard into the course which will make the typing much faster and much easier. Google Input Tools might help you (look somewhere above for details). Ha! You beat me to this idea, I should have read all the previous contributions before giving mine! I agree, virtual keyboard would be great. Search for Nullbrains just a little further down this list. He has made a fantastic automatic keyboard switch with virtual keyboard for DuoLingo - it's a browser plug-in. I've used it with Greek, Russian and Danish! Fantastic! Gave you a lingot for the virtual keyboard !! (So much more useful than the transliteration.) Not all the users from Duolingo have a phone or a private computer where they can change the setting. So, to be equal with everyone, virtual keyaboard is the best solution. Hi I have created a browser plugin for duolingo to enable automatic switching between different keyboards. It also shows an optional layout of the current keyboard in use! Several languages are supported including Greek. Everybody, this is a fantastic app for us! You don't have to keep switching keyboards. The app does it all for you, and even shows you a mini-keyboard to guide you! I installed your keyboard plugin, but I don't know how to get it to come up. Please give a short user guide. Once you come across an input field for a certain language on duolingo for the first time a question is asked if the keyboard has to be changed. Than you can select the keyboard of your preference. In this case Greek. If you would like to change the settings later you can do this in the option menu by clicking on the add on button. I still can't get it to come up. I just get the message that there are no settings. What do you mean by "start a course" - start a completely new language? Log out of Duo and then log in again? Could it be competing with the computer language keyboard settings I've already set up? I finally got to start a new lesson, after having to keep repeating some, and there was your app! It's marvelous! I really recommend it to anyone. Once it's set up, which was really very easy, when it showed up in the new lesson, the right keyboard is available when you need it without having to select it. I'm going to try doing the Russian one, too, because I don't know the official Russian keyboard (RosettaStone used one very similar to the English keyboard.) I'm curious to see what it will be like! And I might as well do it for Danish - except it might not be possible because I've been through all the lessons. Great that you got it to work, using it for your existing Danish course should be possible. With "start a course" I meant that you need to do some exercises on a course until you encounter a question were you are asked to type someting in Greek, Danish, English etc. As you already noted only than the app will show up. What I forgot to mention earlier is that you need to reload duolingo.com after installing the app to load its functionality. Perhaps that is why it did not work earlier. Hope you enjoy the app for all courses that you are doing. And thank you for your comments, I adept the installation instructions. I'm not sure what you mean by 'reload'. I closed chrome and reopened it. But I was mostly working on lessons I was "strengthening" I.e. repeating, and it apparently doesn't work for them, unfortunately. But I went back and did a regular lesson I'd done before and it worked fine. I've used it in Greek, Russian (thanks for the American phonetic keyboard, which RosettaStone uses) and Danish. Thank you, it was a bug in my app that caused it not to function with strengthening. I have updated the app and now it should work. The update should be available soon. ι'μ ιν φαωορ οφ excuse me, I'm in favor of making latin greek input easier for up to about level 10 or so for a simple reason. It's really annoying having to change keyboards every other question or so. especially after I type out the answer and then realize I used the wrong keyboard (often, that happens real often). At the beginning levels being able to type greek on a greek keyboard is less important than being able to read. elleenikee just looks bizarre to me. Why write ee in some places and i in others when the sound is the same, if you're going by sound? Well ee and oo are the ones I'm least attached to. w is fine for omega but h for ita has the problem of distinguishing th (theta) and th (tau plus ita). c for theta isn't the worst solution. Transliteration is about spelling and not sound, per se, writing. Even if latin letters are used einai reinforces the greek spelling in a way that ine doesn't. so that uelv could be used for thelw. It looks weird but the student does get the typing skills. My problem is that I'm a fast, touch typer (I don't look at the keyboard) and switching keyboards every couple of questions is kind of a drag and kills my momentum. On, our greeklish alphabet list all 'ee' sounds are "i" and yes we are going by sound. I'm not sure whose decision was but it is much easier for the learner. The Greek sentence shows the correct spelling. Great input. I wish we could but the Greeklish is standardized and we can't change it at this point. I installed the Greek keyboard on my computer. Then I also bought stickers for my keyboard. how come in the example sentence ποπ κορν is transliterated as pop corn and not pop korn? @LICA98 The reason for the transliteration being pop korn, is that a transliteration aims to use the closest equivalent letter in English and the closest letter to καππα/kappa is K not C.
Edit: In addition to the above which applies to transliteration generally, here we are dealing with Greeklish, which like Franglais is an amalgam of the two languages involved. I know touch typing and I find that I have easier time writing in greek, it's a good skill to know because after you learn it in one language you can convert it with little effort to other languages. Ditto. Only sometimes the ψ and ω still trip me up but otherwise I type about as fast in Gr. now as in English. @Babe945710 In addition to the link that Jaye16 has given you, have a look at the comments by mizinamo and Ifphigenia below.They tell you exactly how to get the accents. HOW TO ADD THE GREEK ALPHABET TO YOUR KEYBOARD These are a few we find easy to install and to use. If you have others please share them with the community. If you encounter problems let us know so we can inform others. https://billmounce.com/freegreekfont/unicode-windows This has screen shots. Why not have a virtual keyboard on the page so that as we click on the Greek letters in the virtual keyboard they'll appear in the text box as if we'd typed them on a real keyboard? It's a bit slower than a real keyboard but it would save installing a Greek keymap and then having to remember which keys produce which letters. Just a thought. Don't know how easy it would be to implement. And if it works on a PC, then hopefully the same idea could be used when you port the Greek tutorials to Android so we can use them on mobile phones. Phones don't have physical keyboards (usually!) so you'll have to do something like that anyway I think when you finish the Android port. The Greek question mark looks just like the English semi-colon but when you are on the Greek keyboard you find it on the Q. To enter both an accent and a diaeresis on the same vowel press Shift+W then the vowel you want to put it on. Thanks again. greeklish is such a bad idea. Greeklish on duolingo will dropped the standard. Stick on greek. Every language is hard to be learnt. Thank you very much! the possibility of transliteration will be very useful! There is also one more very simple method. Open translate.google.com in the second window and set up your source text as Greek and your target text as English. You will see keyboard-like button under the source text window. Press the button and you will get virtual keyboard with Greek letters. At the same time your keyboard will operate in the transliteration mode. So you will be able to type the main group of letters using your real keyboard and the "exotic" letters - using virtual keyboard with your mouse. Also you will be able to check correcteness of what you type in target window. @russelt This is a fantastic idea but I'm afraid I can't agree with your comment that "Also you will be able to check correcteness of what you type in target window." I would not advise anyone to rely on Google Translate to provide them with an accurate translation which would enable them to check the correctness of their answer. to Ifphigenia: Agree. I clearly understand unreliability of Google's translations. But here we are discussing how to type Greek with English based keyboard. What I suggest is a method (imperfect but workable) how to type Greek without installing something new on your computer. And as a bonus you may see what you type somehow translated into English . Believe me, if you will type something seriously incorrect in Greek, Google will give you seriously incorrect translation. And vice versa, good Greek will give you quite good English. Please try. Just briefly. The computer already has many languages in its base. All you do is access them. As a professional translator, I've found that google translate (and all the other translation sites) is unreliable unless you're looking for a specific word --and even then be wary. That is my opinion. @russelt, thanks for your reply, as I say, I think that your idea of using the Greek virtual keyboard in Google Translate is a good one for anyone who has difficulty with any of the other methods. My point is that they should use it only as a keyboard and ignore what GT gives them as a translation of what they have written. Bear in mind that people are trying to learn correct Greek and it would not be helpful or desirable for them to get the idea that the English "translation" that GT was giving them was reliable, otherwise there is a danger that someone might think (quite reasonably if they don't know how unreliable GT is) that they have given a correct answer, which has been rejected, when in fact the answer was wrong. I'm editing my previous comment because I hadn't read the suggestion for the use of the keyboard thoroughly and thought it was another method to access the keyboard in the computer. And I certainly would never condone relying on google or any other site. Their results are tragically inaccurate. Hi I was going to offer this as a work-around: http://gr.translit.cc/ it is an online transliteration tool so if you type "logos" you will get λογοσ and u can just copy n paste. Not the same as google translate. There are two contradicting statements. Some Greek letters have many tranliterations e.g. b for β. These transliterations won't be accepted. I'm assuming the first is wrong. Isn't it supposed to be β ---> v? You're right! The first is wrong. I have corrected it! Hi, I'm managing the key board all right, but am having trouble with the accents. The program is accepting my answers so far. Still, I know I should try to spell things correctly, including the accents. In the German program, there is a box that contains vowels with umlauts and the ss. What am I doing wrong with the keyboard? or is that box something we will be seeing in Greek for vowels with accents? If you can type the basic Greek letters on your keyboard, then you should be able to type the accented letters as well. The accent will probably be on the ; key, to the right of the L (or Λ) key. Type that key (you won't see anything happen) and then the vowel, e.g. ; h for ή. Many thanks here I was trying to think of a clear way to explain. Beautiful job!! The key is to the right of L :) To the left of L is K.
I have said this before about the Russian/Ukrainian courses, but if you are going to make a transliteration scheme, I recommend using one of the existing ones. Why does it contain duplicates? Only the above transliterations will be accepted. Some Greek letters have many tranliterations e.g. h for η, y for υ, 8 for θ, b for β. These transliterations won't be accepted. Almost every transliteration scheme in existence uses b for β and h for η. It's also what you get if you just switch your keyboard layout to Greek. Why does Duolingo have to be different? No, it is Modern Greek with Latin characters. It is used mainly by young Greek speakers. I am young cypriot too! Nobody uses it! Really? :O All the young people I know use or know how to use Greeklish and some of them are from Cyprus! Haven't you seen Greek sentence with Latin characters? e.g. Kalispera! Ti kaneis? Αυτό είναι ελληνικό, με συγχωρείς! Yes, this is Greeklish. It is Greek using Latin alphabet :) How do you say this version in Cyprus? Yes, on my Window 7 it is the same. Thanks for the input it's appreciated. 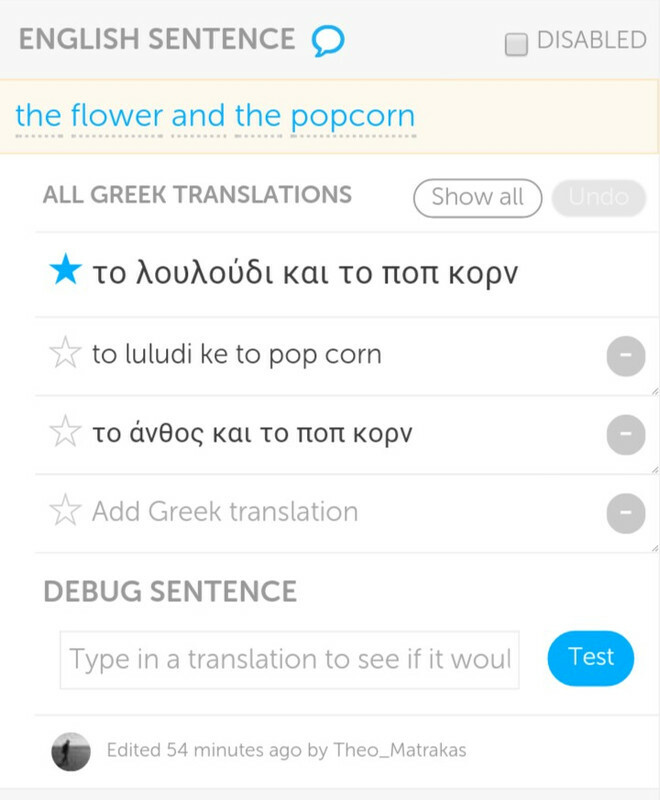 I've tried the online keyboards, as I don't want to download a Greek keyboard on all my computers, but when I type in the letters for the Greek course so I can get the accents right, Duolingo still counts it as wrong. Is anyone else having this issue? Now, I must admit that my computer knowledge is shaky but I don't believe you are downloading the keyboard because ti is already installed in all (as far as I know all) computers. You are just switching the characters. But check before you take my word. Now, as to the problem you are having I can't determine what it is, from what you are telling us. If you have the online keyboard and you type something you can see what you've typed. Right? So, you can also see if what you typed is the same as what the sentence required. When you say "counts it as wrong' do you mean you see it is right but Duo doesn't accept it. By the way, until you get better established don't use accents your answer won't be rejected for lack of accents...but please use them as soon as you get this problem in order. Accents are very important in Greek. Now in order to help you please give an example of what the problem is, Tell us the unit you are doing. What the sentence is. Does it ask you to type the English translation of the Greek or the Greek translation of the English? What did you type and what was the reply? For example; after you type your answer the page will say: Correct, or Incorrect, or Almost correct etc. There is also an option to use English characters instead of Greek. For example: house=σπίτι you can type spiti and it will be correct. We have a list of how to do each letter. Waiting to hear from you. It's only when I'm doing English to Greek translations. I'm typing in on the virtual keyboard exactly what is written and Duolingo still won't accept it as a correct answer. This morning, I was working on genitive cases and determiners, and I would get a sentence like "The woman eats" and if I typed it into a virtual keyboard, it would be considered wrong. I am wondering how can I add tonos to the words, sorry if this is mentioned here but I cant seem to find it. Try the key to the right of the L key (possibly marked with a semicolon ";" depending on your physical keyboard), then type the vowel. Your lucky we only have to use 1 accent now hehe tonos in english is a accent. Just side note: A lot of greeksters (μαγγες) use the English alphabet when the type instead of the Greek letters when texting or chatting. Hey thanks 4 the info. Sorry I'm a bit outta the loop. What is a greekster/magges? A person learning greek? Magges or closer to "manges" are Greek youngsters, who know Greek of course, but use a kind of Grenglish, slang composed of Greek with lots of English characters, and words borrowed from English and abbreviations. This of course if for use on their smartphones. Anyone over 20 is otta the loop and anyway, the language is like shifting sands and changes often. Duo doesn't have a course in it yet. ;-) Btw I can't imagine what "υιικός" means. A better example might be υιοθετώ or άρπυια. I would guess that υιικός has something to do with sons - υιική σχέση "filial relationship", perhaps? perty much it.. greekster = greek youngster but you would only hear that term in Montreal/Laval Quebec, Canada..
As for μαγγες or μαγκες seem can be spelt either way. Its mean something between rebell and hotshot can be used both ways. I searched the thread for "shift+alt" - this is how you switch back and forth between English and Greek letters (and presumably other languages) on the keyboard. On a PC/laptop, not sure if the same for other devices. I'm glad it accepts variant spellings and no accents! Hi, glad you got your keyboard in order. Yes, as you said "shift+alt" will shift all keyboards you have accessed. While the course does not reject answers without accents it is strongly advised that you learn to use them just to maintain a more authentic view of the language. Best of luck and come if you have any other queries just come back and ask. I think what would be better is if the Greeklish letters match up to the same places on a Latin keyboard, so Ω = V, Θ = U, Υ = Y, Ξ = J, and Ψ = C. This would make a lot more sense, for me at least, or maybe you could accept both this sort of Greeklish and the Greeklish used now on this course. Yes, that does sound like another choice for Greeklish but I'm afraid having more than one would be more confusing and not worth the tiny effort to find the correct key on the keyboard. And you will soon realize that only a very small proportion of the sentences require writing in Greek. In the end, the best option is still the keyboard. Thank you for you input. try: α "alfa" -- β "veeta" -- γ "gamma" -- δ "delta"
then do: ι "iyota" -- κ "kappa" -- λ "lamda" -- μ "mee"
then do: ν "nee" -- ξ "ksee" -- ο "omicron" -- π "pee"
then do: ρ "ro" -- σ "sigma" -- τ "taf" -- υ "eepsilon"
then do: φ "fee" -- χ "chee" -- ψ "psee" -- ω "omega"
The whole thing can actually be sung to the tune of the "abc" song, sorta, especially when broken down into these groups of four. you get the idea, right? I sang it to my children when they were babies and it's like a lullaby you can never forget. Once you have the names and lower case memorized, go back and do it again with the upper case. This who process can easily be accomplished in less than 2 hours if you stick with it for the sake of getting it done. Using the key above, I tried "babas for dad and it wasn't accepted--but "mpampas" was accepted. Whatever my problems, thanks for the work which I know must have taken a long time--I have trouble converting my keyboard for Greek & Russian. I have found that alternating between memrise, at which the different alphabet is part of the feature and duolingo is helping me learn the new alphabets. I'm not sure which "key above" you are referring to but in any case, the use of so-called Greeklish is no longer accepted. There are many reasons. The most important one being that we felt you were not really learning Greek. The made-up Greek alphabet was only recognizable to those familiar with it which would mean only users of Duolingo Greek. The rest of the Greek-speaking world would not understand what you were writing nor... and this more important...would you be able to understand real Greek when you saw it. In addition, it required you to learn another new alphabet or look up each letter from the list to write something. Learning the Greek alphabet on your keyboard would actually take less time. Therefore, we no longer accept Greek written in Latin character (aka Greeklish). This was announced on the Discussion stream some time ago. If one of your attempts was accepted by the computer it might be a sentence from which the Greeklish has not yet been deleted. I have never heard of anyone not being able to access a language keyboard on any of the devices I know of be it a desktop pc, or a smartphone. Have you seen the many links we give above to access the keyboards? If there is anything else we can help with we are more than willing. Best wishes.